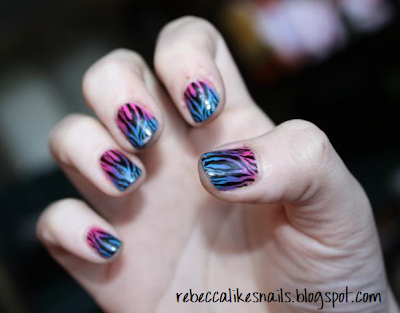 rebecca likes nails: gradient zebra! I got 200 views today while I was at work! Where are you viewers finding me from? I can't figure it out! Hahaha. I like knowing why a bunch of people suddenly found me. Today I'm going to post some nails similar to my first post/favorite nails, but with a different animal print. The darker blue over the pink did made a purple area, as you can see, but there is no purple polish involved! That was one of the tweaks that I did with the favorite nails version. -Sally Hansen Xtreme Wear - Blue Me Away! Every time I see this color gradient I can't stop staring at it! This is so hot! I love it!!! YOu got the views because this manicure is wicked!